IPL 2011 prediction contest is another initiative by SpiderKerala to make our members to have the sprit of cricket which is scheduled to begin on 9th April 2011. With the success of cricket world cup prediction contest, the IPL season 4 contest is expected to get as much participation from the members. As given in the earlier contest, members can register their spot here as the thread comment. Those who wish to participate in the contest have to leave their comment about this new contest. As we are having rules to be followed only members who place a comment in this thread will only be eligible for the contest. This thread will be closed on April 16th,2011. So members be quick in making a space for yourself to participate in the contest. This contest will continue till the final match. This forum thread inviting members to register here for the IPL prediction contest is thereby closing as the alloted 10 days has finished. No intake of new members for the contest will be done here after. I guess Kolkatha Knight Riders is a strong team. Hence I will go with riders as favorites for 2011 title. ICC World cup 2011 contest in spiderkerala are very succesfull.Now Spiderkerala give us another exciting contest "IPL 2011 prediction contest".I wants to participate all contest in this prediction contest.we have our own team in this ipl Kochin tuskers.we are waiting for their performance. A cricket contest & me not in it? No way! Definitely I will be taking part in the IPL 4 cricket prediction contests - each & every one of them. I love following the sport of cricket, but only the shorter versions of the game. That naturally includes the IPL 4 matches! This season is going to be even more exciting for 2 reasons: (1) there are 2 new teams; and (2) due to the fresh auction, there are new players in every team. So old team mates now will be competing against each other. What fun! The World Cup Contest was a big success in SPK and Now it is the time for IPL. This will be an exciting contest since there are so many members to participate. Now Spider Kerala have a vast array of new memebrs and it is a great opportunity to the new members to get cash prices along with sharing your knowledge. So join here and participate in this contest. This IPL is also special for all Malayalees because our Kochi Team is also there in this season. I am eagerly waiting for the performance of our team. I Wish all the best to our home team- Kochi Tuskers Kerala. And hereby I confirm my participation in this contest. 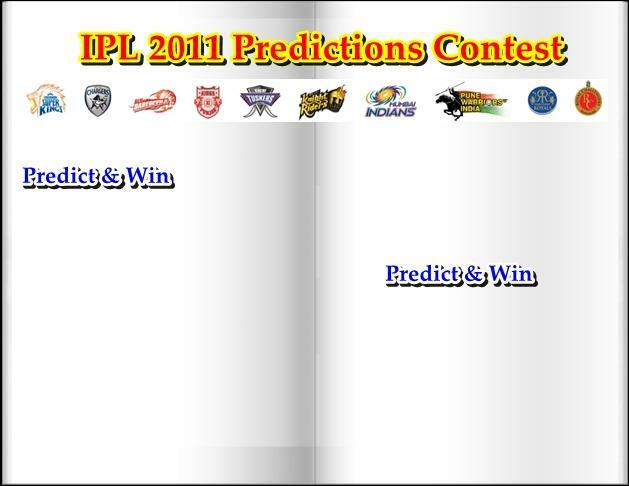 I am very happy to see this IPL 2011 Predictions Contest after ICC World Cup Predictions Contest. A lot of members get cash rewards in ICC World Cup Predictions Contest organised in SpiderKerala. Now It is time to IPL. I was some unlucky in ICC World Cup Predictions Contest because I could not get any reward. But again in This IPL 2011 Predictions Contest, I want to participate and I will surely perform well by my prediction in it. One more prediction contest just after the success of world cup prediction contest is worth to see. I'm damn sure that this one also will be big hit. Just like all other members I'm registering here to participate in the IPL prediction contest. There were some members who couldn't participate in Ultra Mega prediction contest since they hadn't registered their name for the contest. Let that won't happen here. I request all members to register here as soon as possible. I want to participate in this contest i already registered in spiderkerala . I Guess this contest will be very successful. Again one more contest after World Cup 2011. I got selected, on one of the prediction contest on World Cup 2011 at SPK. Now here I would like to register myself under this IPL 2011 prediction Contest and would like to see my luck here too. Hello to all, I am very big fan of IPL. I also want to register in this contest. According to me Mumbai Indians will rock in this IPL. We already witnessed a superb glorifying exciting contest previously with ICC World Cup Prediction Contest in SpiderKerala. Well again one more prediction contest for all of us to win some good cash! Well SPK is leading the way for a futuristic exciting site for prediction and winning too! Many thanks to Webmaster sir for introducing it for the secong time for us! Surely I would love to participate down for the contest sir! Another contest from spiderkerala. I wants to participate in this contest. Thanks for putting up another big contest from your side and hoping that i would be given a chance to participate in this contest and make it a mega success. I also want to participate in the contest. The previous contest was really superb and I missed to register my name for the last contest. I don't want to miss this time. Once again an exciting contest in SPK. I wish Chennai Super Kings to win once again IPL 2011. Let me also participate in this interesting IPL Contest. I think Chennai Super Kings is a superb team. Here are my predictions for the upcoming match. I am really sorry for what had happened in the world cup contest. Me also like to participate in this contest. Once again SPK opened the door of entertainment through this wonderful contest. i am in. Let's see who gets lucky. My prediction for final is csk vs pune warriors. Another exciting contest from Spiderkerala. ICC cricket world cup prediction contest was one of the biggest success from SPK. Lots of members have participated in the contest and get exciting prices. I think IPL 4 will also be the one of the success of SPK and I love to be the part of IPL 4 contest. i just missed out the ICC world cup prediction contest.This time i will definitely make the best out of it.i am really thankful to spk for offering such contests to us. I'm new to this site and will love to explore this contest area. Am also participating this forum.